Many instruments with flat tops and backs actually have some slight arching built into them. The arching ads stiffness and strength to the thin top and back. On guitars the soundboard must not only create the sound of the instrument but it also must resist the tension of six strings. Traditional dulcimer designs usually employ the finger board carrying most of the string load, however some slight arching of the top and back can allow me to make them thinner and more resonant. The arching also helps the top and back resist warping when the humidity changes. I consider a certain amount of “movement” of the top and back to be a part of the nature of a lightly built instrument. I prefer this to having an instrument that is built like a brick as they usually sound as good as a brick! 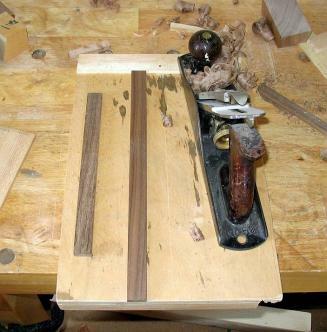 First I take the rough sawn brace stock and plane it to thickness using a bench hook and a plane. My method for arching the braces is simple. I have a jig that is nothing more than a piece of wood slightly thinner than the thickness of my braces. The ends of one edge are a little higher than the center. I figured out the proportions of the jig by eye, experimentation, and feel and to get the desired amount of arching. The hole in the jig serves an important purpose; it allows me to hang the jig on a nail so I don’t sweep it up and throw it in the scrap bin! I put the jig in the front vice of my bench. 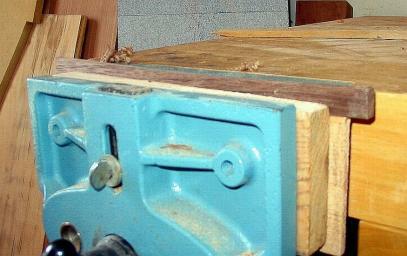 The straight part goes against the bottom of the vice and the edge with the elevations faces up. 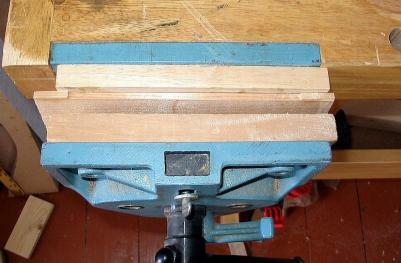 I place the brace on top of the jig with the quartered grain running perpendicular to the floor. I use a block of wood to press the center of the brace down till it touches the low part of the jig. I hold it there with one hand and tighten the vice with the other. Since the jig is a little thinner than the braces the result is a brace that is firmly held in the vice and bowed down at the center. The surface facing up and out of the vice is the surface that will be glued to the instrument after the brace leaves the jig. Since the center of the brace is pressed down the ends are higher. I plane the top of the brace flat. Once this surface is flat I open up the vice and the planed surface of the brace springs up into a perfect arch that is ready to be glued to the soundboard. Here you can see the planed surface of the brace against a straight edge. Notice that the ends of the brace gradually taper away from the center. It is not easy to see in the photograph but it is there. This is the slight arch that I have aimed for.